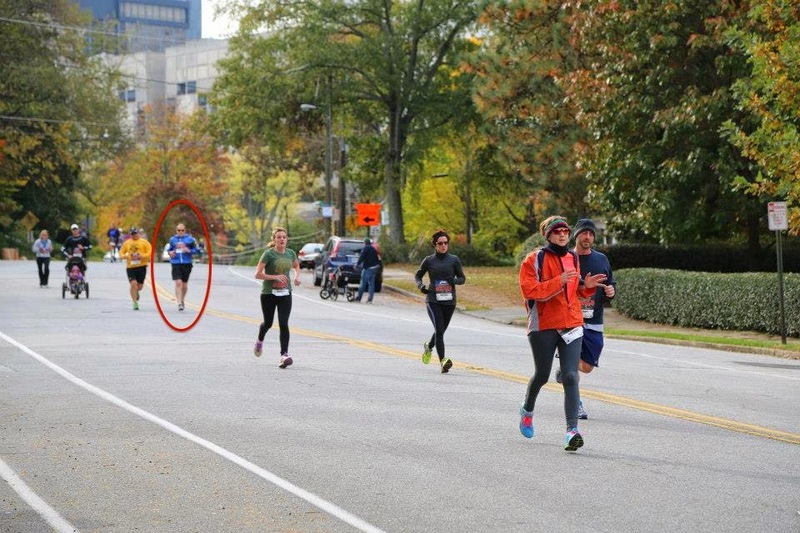 Shortly after completing the Winship 5K in early October, I began thinking of my next race. On Active.com (where the results from the Winship race were posted) I found a 5K in Ansley Park, between Midtown and Buckhead, and Peachtree and Piedmont. Ansley Park has always my “dream neighborhood” if only money was no object. I awakened around 5:45 am on Saturday morning, prepared my race-day breakfast: oatmeal, a banana-blueberry smoothie, and a cup of French vanilla cappuccino. I alternated stretching with sitting and reading, and felt good by the time I left the house around 7:45 am. The only problem was that it was COLD! 36 oF. I wore the shirt from the Winship 5K, but no one could see it under the new running jacket that I was wearing. I arrived at the parking area for Rhodes Hall around 8:15 am, and joined the group gathering on the lawn. I estimated that there were several hundred people in this race, but fewer than a thousand. This was a dog-friendly race, sponsored by Eukanuba, and quite a few runners brought their dogs. A d.j. was playing music as my cold fingers pinned my number (62680) onto the front of my jacket. Fortunately I was not too cold, thanks to the jacket. The announcements began around 8:30 am, followed by some organized upper body stretching, which felt good. I also paced in place as much as possible, to keep warm and to stay loose. At 8:50 am we were directed to line up on Spring Street, facing Peachtree Street. I lined up about 50 feet behind the starting group, with the walkers, dogs, and strollers toward the back. As I waited for the 9:00 start, a woman wearing an orange NYC Marathon jacket was to my left. If she ran the marathon, she must be pretty good, I thought. The start and first kilometer: The signal to begin sounded promptly at 9:00 am, and the entire group moved forward at a jog. This time the start was smooth and there were no walkers in my area. We jogged onto Peachtree St. followed by a quick right onto Beverly Rd. Beverly was a straight east-west street, with gently rolling hills. The first stretch was a long downhill, and I picked up speed, merrily passing quite a few other runners. I felt really good, but in the back of my mind I hoped that I had not started too quickly. After a couple of blocks the road reached a bottom and gradually increased in elevation, but I continued forward at a good pace. I certainly didn’t want to get passed in the first km by anyone that I sped by in the first minute. I looked ahead and saw the leading runners were already several hundred feet ahead of me. As we neared the end of the straight stretch of Beverly Road, RunHelper signaled that I covered the first kilometer in 4:49 min. This was the first time that I clocked a kilometer in less than 5 minutes. The second kilometer: We turned left onto Montgomery Ferry Drive. I maintained a good pace as we ran past the police, who stopped traffic for us to pass. Montgomery Ferry turned to the right just south of the Ansley Golf Club, then turned left to pass in front of the clubhouse. There were quite a few spectators, and I stayed to the right side of the road since there were a couple of cars that were trying to park (or unpark, I wasn't sure). Immediately after passing the clubhouse, we turned left onto Golf Circle, a loop overlooking the golf course. 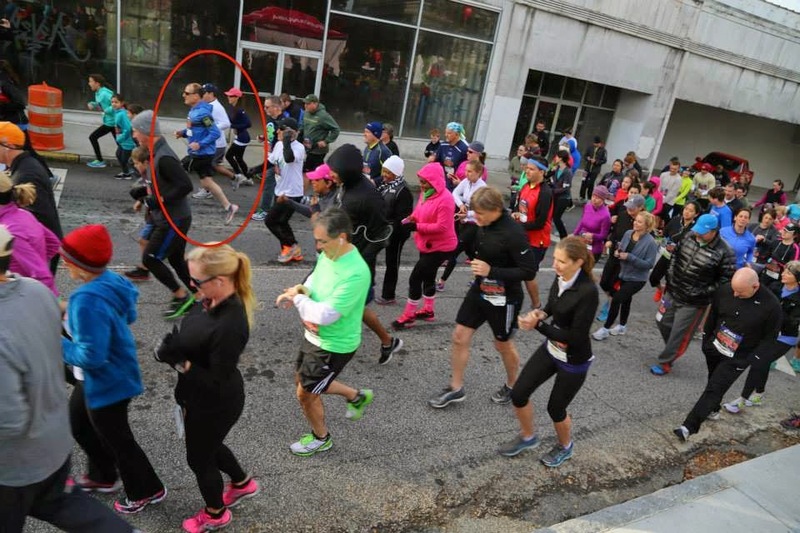 At this point I realized that Ms. NYC Marathon was running to my left and passing me. I remembered my plan to run harder for the last ¼ of each kilometer, and I managed to stay within 10 – 15 feet of her. I decided that she would be my target for the remainder of the race. As we circled back towards Montgomery Ferry, RunHelper signaled the second kilometer at 9:49, a total pace just under 5 minutes per km. The third kilometer: The last stretch of Golf Drive was uphill, and I slowed a bit to a more normal pace. We turned right onto Montgomery Ferry. The water station was in front of the clubhouse on the right side of the road, but I was running on the left of the road and missed taking a cup. One runner stopped (!) and came back to the water station, but I zipped past even as I realized that I would have liked a sip of water. Oh well, I could make it without water. Our group continued down the left side of the road as we passed on our right the slower runners and walkers as they turned onto Golf Drive. The route continued to the south as Polo Drive, with a nice view of the golf course to the left. NYC Marathon steadily continued to run 10 – 15 feet ahead of me, even though I tried to speed up for the last ¼ kilometer. Oh well, the important thing was to keep her in my sights. We turned left onto a short downhill stretch of Beverly Road, then right onto Maddox Drive. RunHelper sounded the end of the third kilometer, at 15:15, total pace 5:05 minutes per km. The fourth kilometer: As we turned left onto Park Drive, I resolved to pick up my pace, to recover a pace less than 5 minutes per km. But I was immediately confronted with the reality of a long, long uphill stretch. I started breathing really heavily, trying not to audibly groan. NYC Marathon was increasing her distance from me, and I couldn’t run any faster. I saw a woman with two young boys watching the race from the sidewalk and as I passed I overheard her tell the boys “This is a really tough hill.” My uphill struggle must have been evident. "When will this hill end?!" I thought. Finally we reached the top and turned right onto Winchester Drive. Thank goodness this next stretch was relatively level. As we reached The Prado, the organizers had stopped several cars along the route for us to cross. We continued onto Winchester Drive with Winn Park to our left. This has long been my favorite street in Ansley Park, looking over the beautifully shaded park with a small creeklet in the bottom. But a van was trying to turn right from the Prado onto Winchester, and threatened to get between me and a group just 20 feet ahead. The driver must have been hoping that I would slow down and leave a gap large enough for him to pass through. But this stretch was mildly downhill and I wanted to maintain whatever speed I had managed. I picked up the pace to run at the same speed as the slow-moving van, then passed the van on its left, and after safely passing the van, I finally moved back over to the right half of the narrow street. After another moment, the van finally passed me and the other runners in front of me. Near the end of Winchester Drive, I saw the sign marking 2.5 miles, and RunHelper signaled the end of the fourth kilometer, at 21:21. My pace was now 5:30 minutes per km. There was no longer any possibility of finishing in 25 minutes. But I could still beat my Winship time of 28:22 if I didn’t slow down any further. 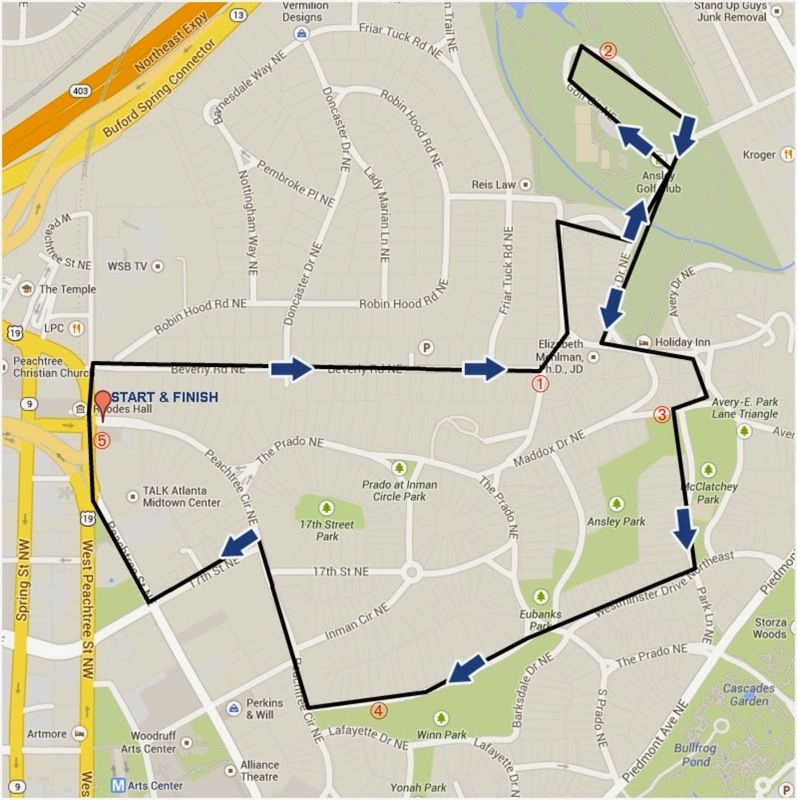 The fifth kilometer: We turned right onto Peachtree Circle for the final stage of the race. I saw Ms. NYC Marathon about 100 feet ahead of me. Peachtree Circle was a wide street, fairly level, and I was keeping up with the other runners on the street. Because of construction to build a traffic circle at the intersection of The Prado with Peachtree Circle, the route this year was detoured, and we turned left onto 17th Street. This block was uphill, but it was a short stretch and Peachtree Street was in sight. "The End Is Near!" The police directed us to turn right into the right-most lane of Peachtree Street, as we passed the 3 mile sign. NYC Marathon was still in view. 0.11 miles to go = about 185 yards = about 170 meters. RunHelper sounded the 5 km mark as we reached the intersection with West Peachtree, and I could see the finish line! I increased my pace and found a remaining reserve of energy. I managed to narrow the distance between me and the closest runner in front of me, although I didn’t quite manage to pass him before the finish. Nonetheless the clock showed 27:46 as I crossed the finish line. Hooray!! Personal record, and goal met! Aftermath: Unfortunately they did not provide a cool-down area and I had to stop almost immediately, which I really didn’t like, as I was accustomed to slowing only to a walk to avoid pulling anything. The organizer was handing out blue tags that we had to fill out by pencil (low-tech race). I stopped at the finisher’s table, filled out the tag with my 27:46 time, and dropped it into the tray for Males 45 – 54. Another runner handed me a bottle of water. I walked back to Peachtree Street and watched the slower runners as they approached and passed the finish line. I sent Bonnie a text with my time. Although RunHelper was not entirely accurate with the distance (measured 5.20 km) here were my splits in minutes per kilometer: 4:49, 5:00, 5:26, 6:06, and 5:42; and splits in minutes per mile: 7:37, 9:00, 9:32. After a few minutes I crossed Peachtree Street to return to Rhodes Hall. I picked up a Powerade and a banana, and after a few more minutes accepted a small pulled pork barbecue sandwich from the caterer (it’s Atlanta after all). In the awards presentation, the winner finished in 18:15, and the first six dogs (and their runners) also won awards. NYC Marathon finished second in the women’s 35 – 44 age group, and I took personal encouragement from realizing that she finished not that many seconds ahead of me and still won an award, albeit in a different division. The best thing, in addition to my improved time, was my rapid recovery. My heartbeat and breathing quickly returned to normal. The temperature was 45 oF shortly after I finished, so the colder temperature may have been helpful. Goal: To improve on my previous time of 28:22: Achieved!